When it comes to growing cannabis, grow lights are some vital pieces of equipment to have on hand. Because most people keep their cannabis plants indoors they have no access to the sun which is something all plants need. However, you don’t need to sun to help grow your plants when you have a grow light. They work the same way as the sun providing warm heat and lighting for your plants and can shine various colors, like red and blue, which keep your plants healthy and can help them to grow quickly. If you’re looking to find a grow light for your growing space, keep reading. This article will highlight the top grow lights you should consider investing in. The benefits of grow lights are numerous. Below are some of the top benefits they offer. Grow lights can help your plants to grow quickly because they feature unique colors to shine on your plants and can run for long hours. This is unlike if you had outdoor plants which rely on sunny and warm days. With grow lights, your plants will be able to bask in the warm glow even during the night so they grow quickly. In fact, you usually can start to see results within 2 weeks after having used a grow light with your plants. While some grow lights are very expensive, a majority aren’t. They tend to be very inexpensive so everyone can invest in one without fear of breaking the bank. Because of their affordable price, you can usually buy a few to use together to get the best results. If your grow light ends up burning or breaking, don’t fear! Grow lights are easy to replace and you can instantly find a new model to use. So, if you like one model you’ll more than likely be able to replace the broken one with the same brand. One of the best things about these products is that there’s a wide variety available for you to choose from. You can find grow light with full spectrums, circular housings, and dimming features. There are plenty of options to choose which means you’re sure to find one that will work well in your growing space. Grow lights are simple to use. You just hang it up over your plants a few inches, plug its cord into the wall, and turn the power switch on. While some can be a little more technical (especially if you’re looking for an advanced option) a majority are very easy to use. While grow lights tend to be pretty similar they each have their own little quirks and features which is something to look for. Below are some important things to consider before investing in any model. A full spectrum is not necessarily crucial when it comes to growing plants, but it can help them to grow much more quickly and strongly than just regular red and blue lights. You’ll want to consider investing in a full spectrum grow light which contains the helpful UV and IR rays. While this can sometimes increase the price of a model, the investment is well worth it. Grow lights can sometimes be a little heavy, especially when they contain numerous heavy light bulbs. Because of this, you’ll want to consider how heavy the model is to ensure that it won’t accidentally fall or damage something in your growing space. A heavy grow light will only cause problems. If you’re looking to find a grow light for your hydroponic system this is an incredibly important feature to look for. A grow light that is not waterproof can be dangerous to use with hydroponics as even the smallest amount of water near or on it can cause electrical shocks and damage the grow light. You’ll want to look carefully to ensure that the model you’re interested in can be safely used around water. If you want to use more grow lights in a certain growing space, a daisy chain is something you need to look for. A daisy chain is usually located on the side of a grow light’s housing and is a special port that you can use to connect a grow light to another. So, in other words, you can have a long grid of grow lights running together at once. If this sounds like something that would benefit your plants, definitely be sure to look for a daisy chain. Grow lights come with various prices. While an expensive one might be tempting to buy, it isn’t always the best. Usually, expensive models come with features and technicalities that really are designed for more experienced growers to use. If you’re just starting out with growing cannabis, it’s ideal to invest in a more affordable model to make sure it’s something you actually enjoy doing. An affordable model can also help you to experiment a little more with how things work without fear of breaking a huge investment. When shopping for a grow light you’ll come across a few different choices. Below are some of the most common types and how they differ from each other. LED (Light Emitting Diode) lights are some of the most popular grow lights to use with indoor plants. Not only are they affordable, but are very energy-efficient which means they won’t overheat and cause damages to your plants or lighting system. This is due to them emitting narrow wavelengths which don’t shine as much heat as other grow light types. HID (High-Intensity Discharge) lights are best for experienced growers to use. They are built into a glass tube which is filled with a special gas which changes the light’s color and intensity. This type usually needs a ballast in order to work well and tends to need to be replaced often. Fluorescent lights are another popular choice due to their affordability. They are bright and shine a natural looking light on your plants which can be a great substitute for sunlight. However, they don’t come in many choices and you usually need to replace them often. Do I Need to Use a Ballast? Some grow lights, like HID ones, need a ballast in order to work safely. A ballast is a device that you can connect to the grow light to help control the light’s output and intensity so the bulbs don’t burn out or overheat. In other words, they’re a safety device to help ensure your plants grow well and without problems. Some use switches on the side to activate it while others are more modern have digital displays you can use to adjust it. If you decide you need to use one of these devices with your grow light, there are two types you’ll come across: magnetic and electronic. Magnetic ballasts contain wire and steel in them which cause friction inside the grow light to create a voltage. These types are often much larger than electronic ballasts so they’ll take up some room in your growing space, but they are much more durable compared to electronic ones. Electronic ballasts use things like microchips to heat things up rather than wire and steel like magnetic ones. These models tend to be lighter and more compact and also run a little cooler so there’s no worry of them overheating. However, they don’t last as long as magnetic ones do. When it comes to helping your grow light last there are a few things you can do. While these lights can run for hours safely you sometimes want to give them a break. This will not only allow your plants to have some sleeping time (which they need), but can let your grow light take a rest too. Your model will usually come with a recommended running amount so you can keep track of it. Sometimes bulbs will eventually dim or burn out. When they do, it’s important to replace them as soon as possible. This will not only help your plants to receive an even amount of lighting, but can prevent the grow light from focusing its energy on another area that is currently working. This focus can end up causing other bulbs to overheat which can damage not only your grow light, but plants. To ensure your grow light lasts, it’s best to keep it in one designated spot. This way you can learn how it works well in that area. Moving it around often can end up ruining the impact it has on your plants and might even damage the grow light itself. There are plenty of equipment pieces you can use with your grow light to not only help it run longer, but encourage your plants to grow quickly. One vital piece of equipment you’ll want to have on hand is a fan. There are plenty of different types of fans you can invest in and all will help to keep your growing area cool. This is important as lights that heat up and burn brightly can add to the warmth of the room and could suffocate your plants. By keeping a fan running, it will help to keep the air circulation moving so the air isn’t stuffy. While not crucial, another good piece of equipment to use with your grow light is a grow tent. These are special tents designed to be a space where you can keep your plants so they can grow. They basically work as mini greenhouses you can keep inside your living space. There are plenty of different grow tents you can invest in like walk-in ones or just small boxes. No matter which you choose though it will keep your plants well protected from outside elements and hidden as well. 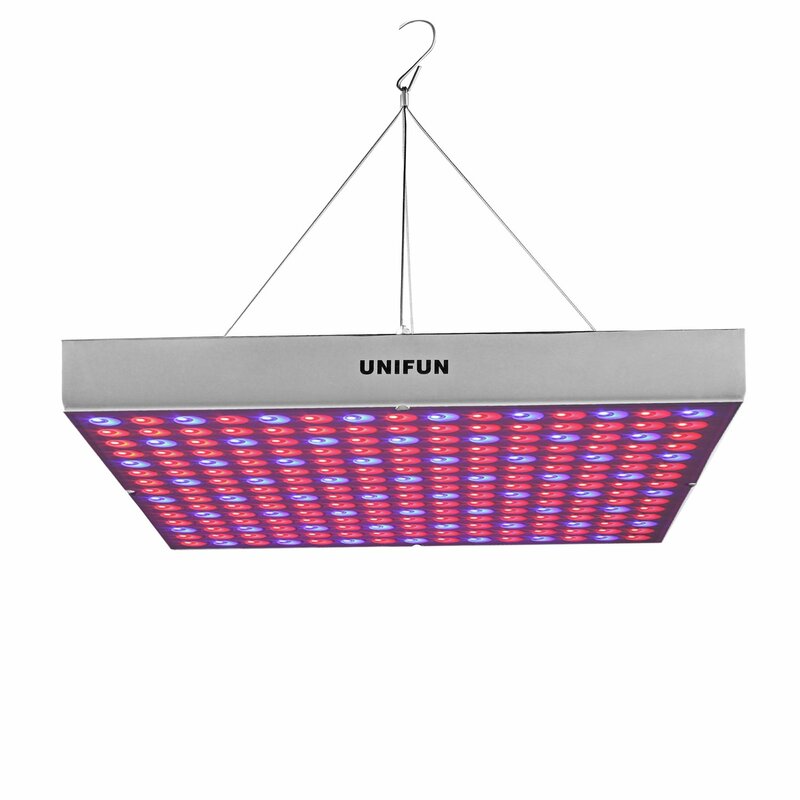 The Unifun LED Grow Light runs on 45W and includes a wide spectrum of colors. You’ll find over 161 red, 56 blue, 4 UV, and 4 IR LED lights built into it which help to quickly grow your plants so they are strong and healthy. While it features strong lights, its housing is made out of a thick material and coated in a special black paint to help it absorb heat so it doesn’t burn your plants. This grow light should be hung about 12-18 inches above your plants for best results and you can use the hanging kit that comes with it to help with this. 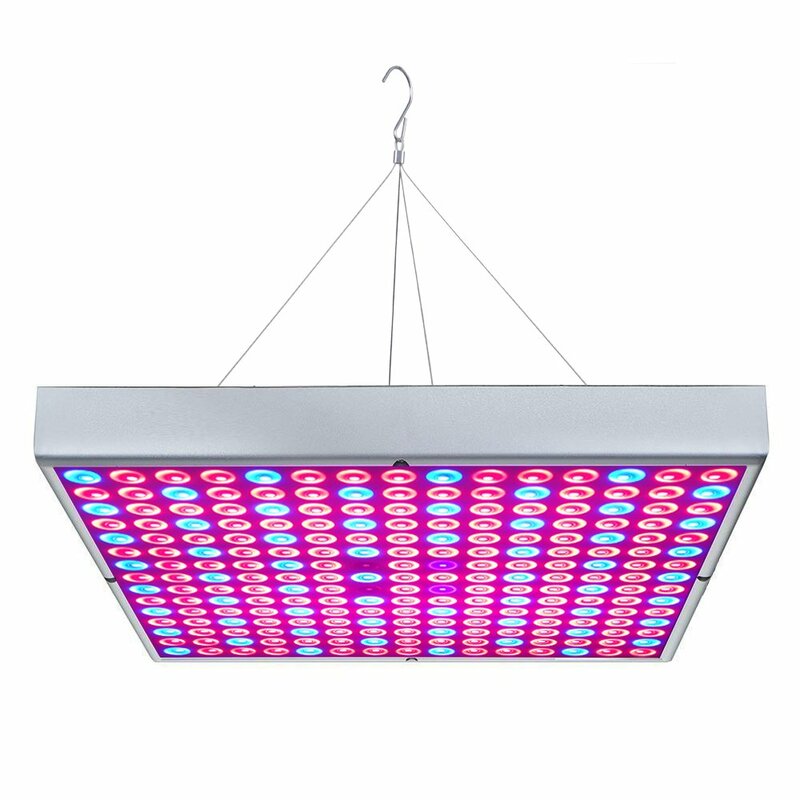 This grow light is an affordable model and very compact which makes it ideal for those on a budget and who have limited space. Keep in mind this model is not waterproof so it’s best to not use it with hydroponic systems. 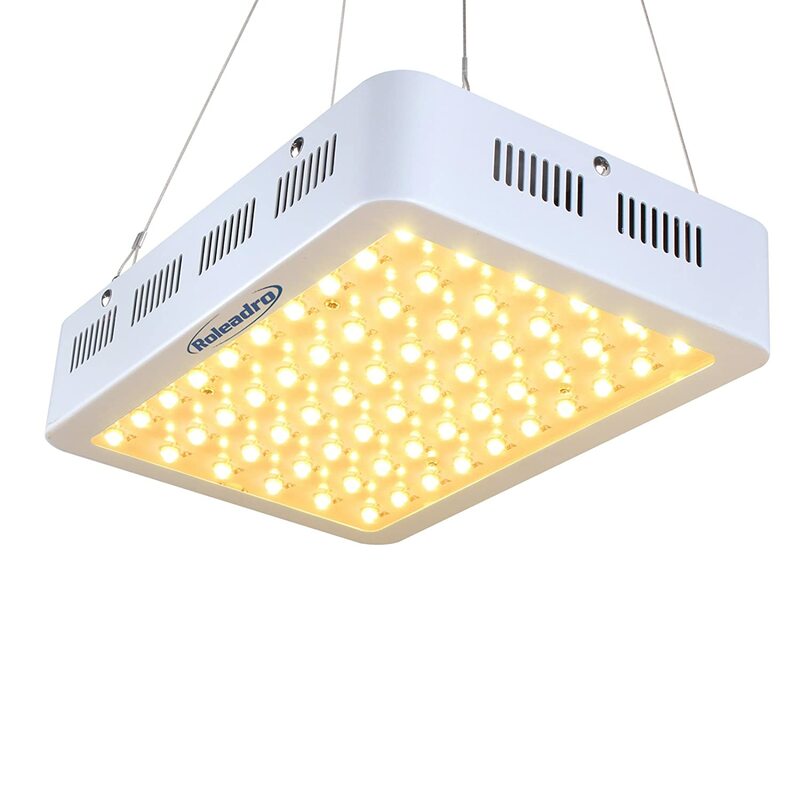 The Shengsite UFO Grow Light is a unique model for growers to use. It’s made out of a circular housing which helps it to focus its bright light beams on specific areas on your plants. 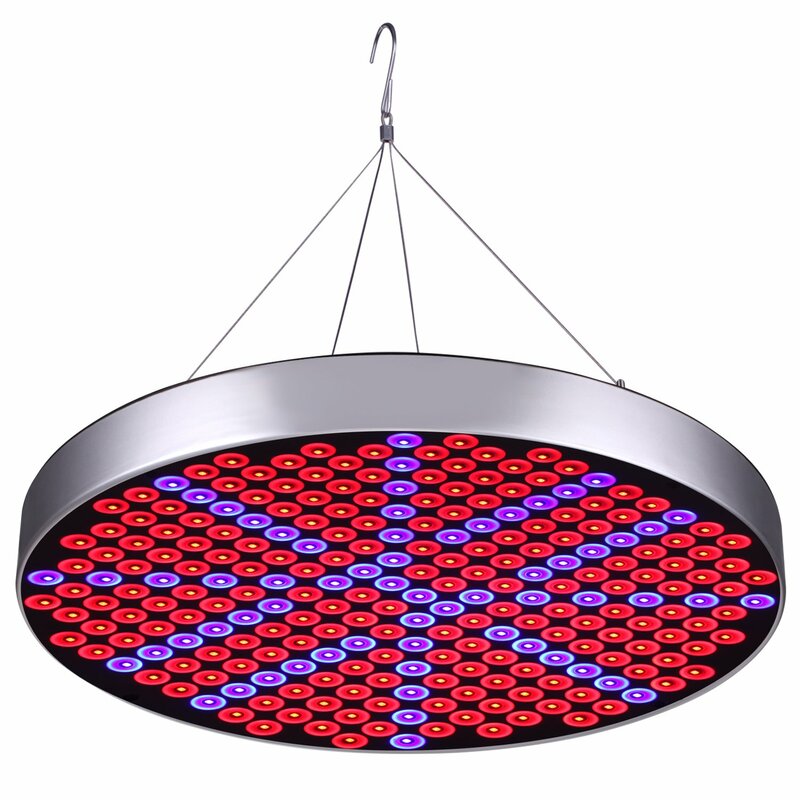 The grow light has over 250 LED lights featuring various shades of red and blue. It runs on 50W and can be used for about 13 hours per day without fear of it overheating or burning your plants. Better yet, the lights have a lifespan of up to 50,000 hours so you won’t have to worry about having to replace them anytime soon. These lights also feature a 60 degree reflector to help keep the plants warm and cozy. This model can be used with all growth stages and even with hydroponic systems. It comes with a hanging kit you can use to help keep it secure above your plants. This full spectrum grow light by Newforshop runs on 30W and has many red, blue, UV, and IR lights built into it to help your plants grow. It’s built out of a sturdy aluminum frame which is quite durable and compact so it won’t take up much space. This frame is also specially designed so it doesn’t overheat and collect dust which can hinder the lights from working properly. 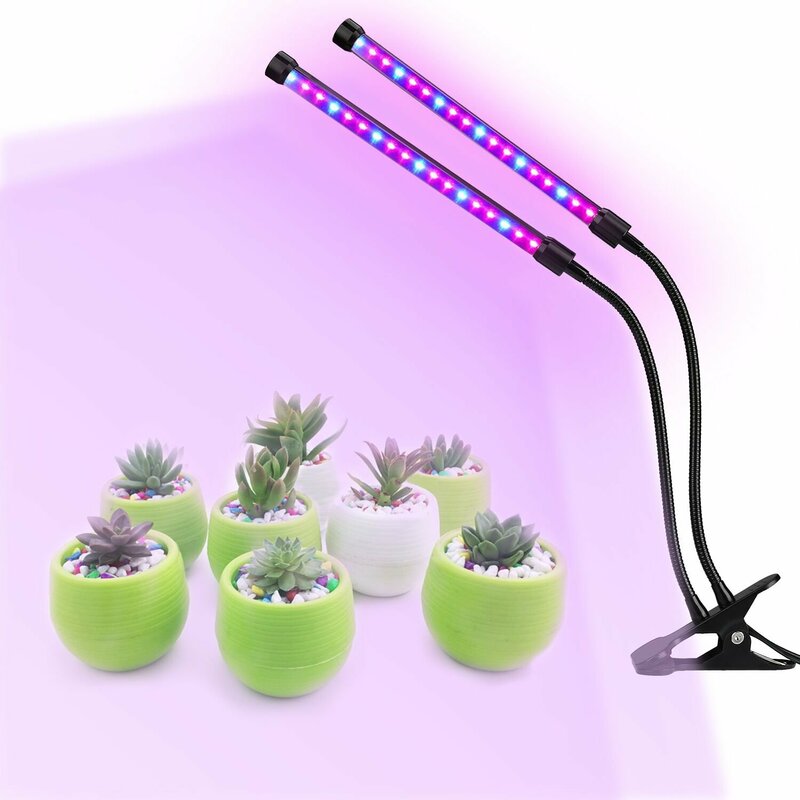 The Newforshop Grow Light works quickly and can shine on your plants for about 15 hours per day safely. These lights are extremely bright and have a lifespan of up to 50,000 hours. They also have a 60 degree reflector built into them to help shine various angles of light on your plants to coat them in it. The Philzon Grow Light is ideal for those who are experienced with growing cannabis or who want to get serious with their hobby. While expensive, it does come with some helpful features you can use to help grow your plants quickly and so they’re healthy. One great feature built into it is a thermometer and humidity monitor which will work to keep track of the growing area’s temperature and humidity to ensure it’s at the correct levels. The lights of this grow light are full spectrum and shine at 90 and 120 degree angles. These 600W lights are built to not overheat so you can shine them on your plants for up to 15 hours per day without problems. 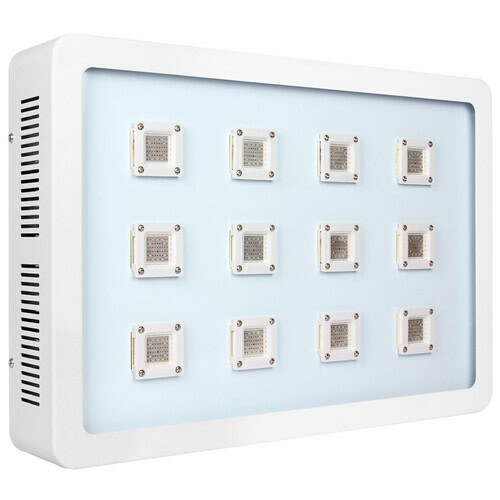 The lights also feature 10W double chips which will give you extra angles and color shades to help your plants. 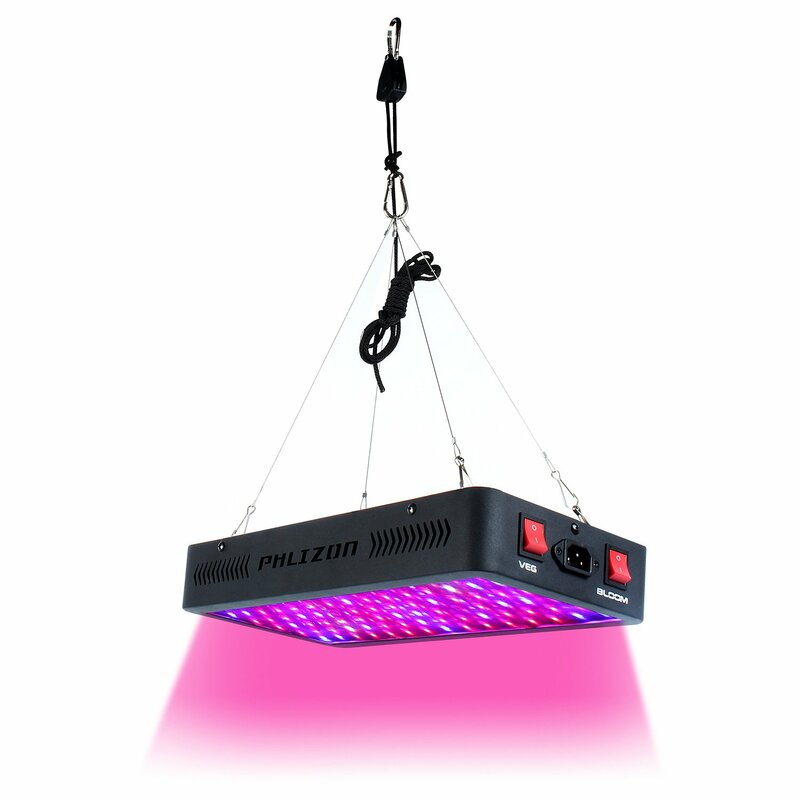 This grow light comes with a hanging kit that can be adjusted during the various growth stages. However, it’s not waterproof so it’s best to keep it away from hydroponic systems. The Vintage Grow Light is a compact, inexpensive model which makes it great for small growing spaces. It features a dual spectrum that runs on 12W and contains lights that burn brightly but don’t overheat. This makes it a very energy-efficient choice so you won’t have to worry about needing to constantly invest in new bulbs. 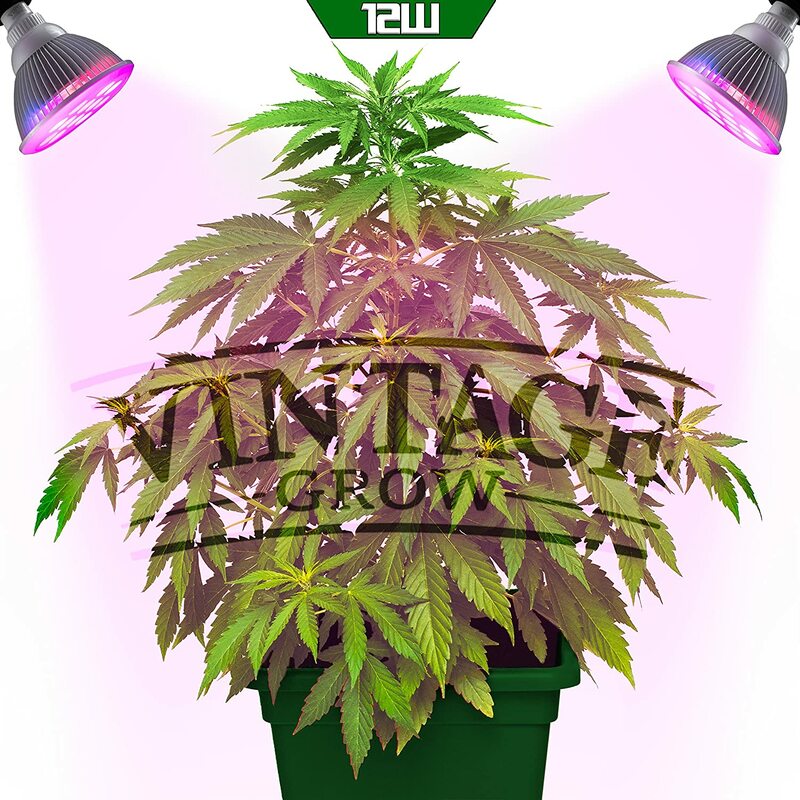 The Vintage Grow Light is also very affordable so you won’t break the bank by investing in it. The Lovebay LED Grow Light is a unique grow light on the market. It consists of a dual head which is attached to a 360 degree gooseneck device which allows you to twist it around to hit certain angles on your plants. The heads have 36 LED lights in them and come with a few features you can use to help adjust them according to your preferences. One feature built into them is a timer. This timer can be set for 3, 6, or 12 hours. It also has 5 different dimming levels so you can choose the level that will best work for your plants. The lights built into it include the necessary blue and red spectrums and can be left on for longer than 5 hours without fear of overheating. While small, these lights work quickly and are great to use with hydroponic systems. 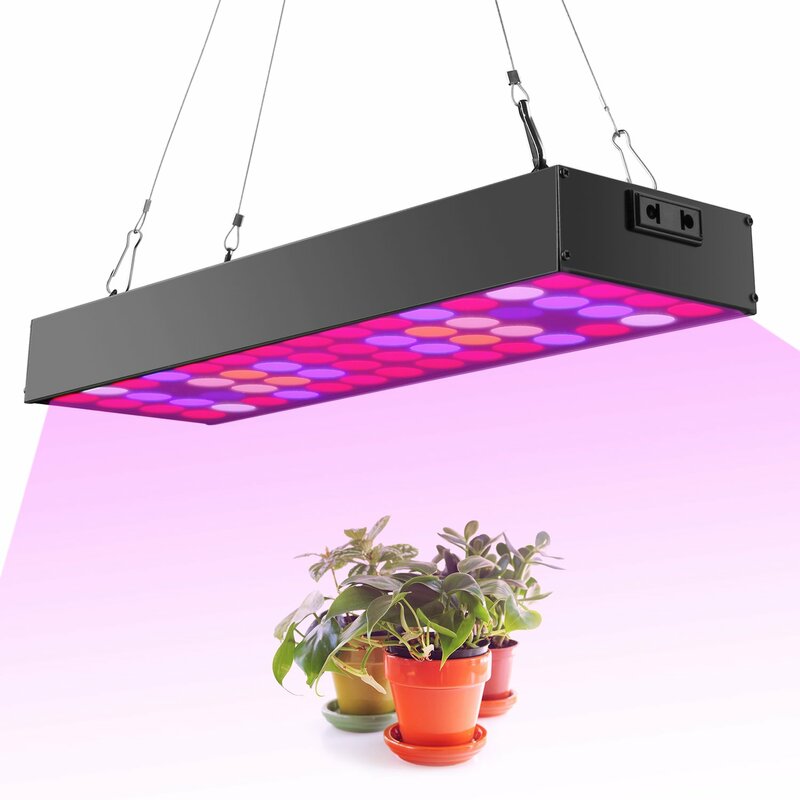 This grow light by Roleadro runs on 300W and features a full spectrum of colors. These lights have a lifespan of about 100,000 hours so you’ll be able to burn them for a long time before having to replace them. This grow light runs very quietly which is ideal if you plan to keep it on for hours and is also lightweight so you don’t have to worry about it being bulky and falling. It does tend to be a little expensive though so it’s best for those who have been growing for a while to use. 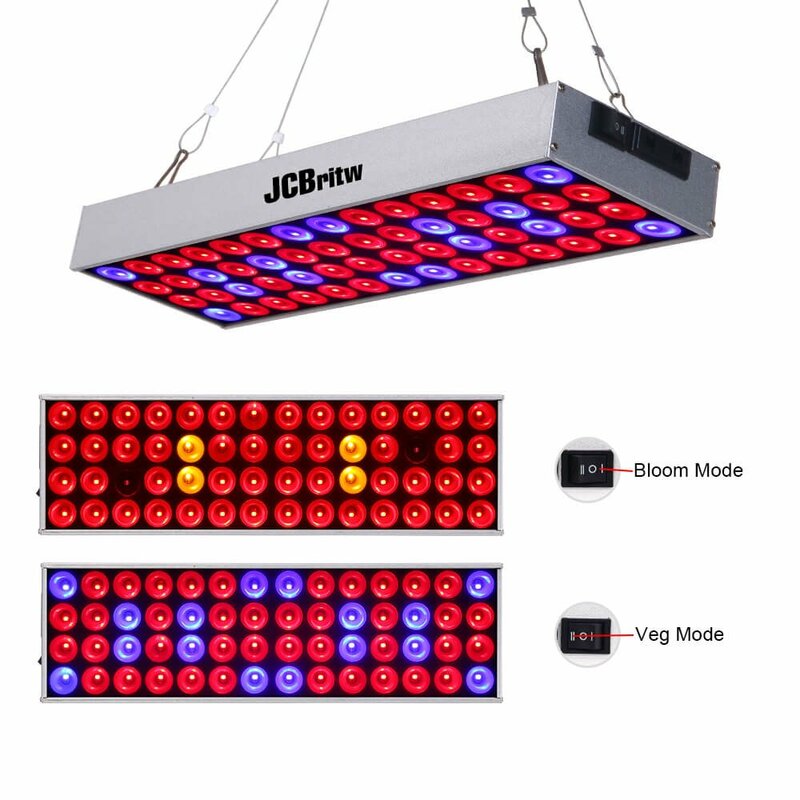 The JcBritw LED Grow Light features a full spectrum that runs on 30W. These lights burn brightly and have a lifespan of over 50,000 hours. They also have a 60 degree reflector built into them which will help the light beams to reach all areas of your plants so they are completely covered in warm lighting. This model is very compact so it won’t take up much space and can also be connected to a timer. It features a daisy chain so you can connect other similar devices to it and works safely with hydroponic systems. This product is also designed to be energy-efficient so it can run for hours without fear of it overheating. This LED grow light by Osunby runs on 45W and features a full spectrum of colors including UV and IR rays. These lights are very bright and have a lifespan of 50,000 hours. It fits well in a 3 x 3 ft. growing space and comes with a steel hanging kit you can use to hang it over your plants. This affordable model is not waterproof so it’s important to keep it away from any traces of water to prevent damages to it. 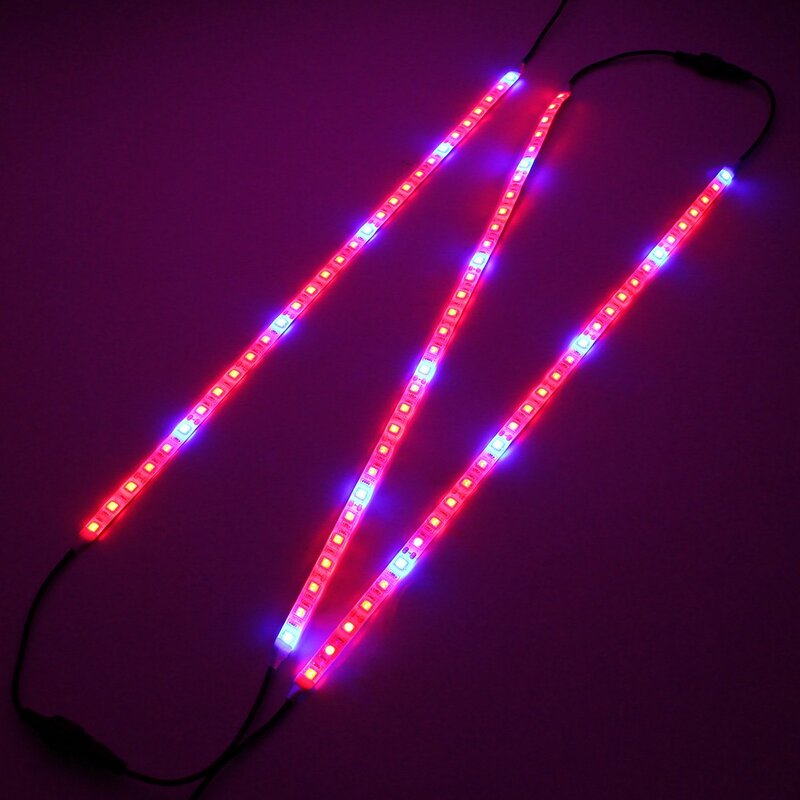 The Solmore Grow Lights feature 3 strands of lights that can over up to 1.6 ft. with warm lighting. These lights are attached to each other and features the necessary colors like red and blue. You can move these lights around in various angles thanks to the adjustable neck they are attached to. These lights can run for up to 12 hours without fear of them overheating and can even be customized so they fit your specific growing space. Because of their compact size and water-resistant features, these lights are great to use with hydroponic systems. Grow lights are a terrific way to help keep your plants strong and healthy. Not only are they easy to use, but they come with various features that you can set to help ensure your plants grow well. It doesn’t matter if you’re an experienced grower or someone who is just starting out – grow lights can help both of you have a bountiful harvest.